There have been any many attempts to recreate the tragedy of Titanic’s sinking including a certain eight hundred pound gorilla directed to Oscar glory by James “King of the World” Cameron who took advantage of the latest technology at the time (and again with its recent 3D release) to bring the drama to life. As spectacular as Cameron’s version was, it was full of melodrama and was just as much about a doomed relationship than it was about the actual disaster. However back in 1958, this docudrama titled A Night to Remember was released that was adapted from Walter Lord’s superb book of the same name. This film was focused on being as historically accurate as possible at the time even to the point of building the sets based off of the actual blueprints of the ship and hiring Titanic’s fourth officer Joseph Boxhall as a technical advisor on the film. A Night to Remember starts off much like the other films as we watch the journey begin and the passengers settle into their respective place on the ship. The first class passengers enjoy the opulent dining rooms while the the others experience different surroundings depending on what kind of ticket they bought. As this was Titanic’s maiden voyage, her builder Thomas Andrews (Michael Goodliffe) and White Star Line Chairman J. Bruce Ismay were aboard as were many other well to do people from both the American and British upper-class. Out on the open sea, we see Titanic receive many warning about the icebergs in the area but they are either missed or completely ignored. Captain Smith (Laurence Naismith) decides to continue on at high speed despite the ice, possibly at Ismay’s urging so they could set a new speed record. Late on April 14, 1912, lookout Frederick Fleet (Bernard Fox) sees a huge iceberg directly in front of the ship and calls out a warning, but the ship is so large that it can move to port fast enough and the first five starboard compartments along the side of the ship are ripped open below the waterline. Andrews, Smith, and second officer Charles Lightoller (Kenneth More) are brought to the bridge to determine how bad the damage is and they are horrified to learn that despite its reputation as being unsinkable, the Titanic is doomed because too many compartments are flooded. To make matters even more dire, they know that the ship doesn’t have enough lifeboats to save everyone on board. From that point on it’s just a matter of time before the ship sinks and we witness Captain Smith and the rest of his officers do what they can to save lives. They try signaling nearby ships for assistance but none respond even though they can see one off in the distance. Unfortunately for them, the radio operator is off duty and even when Titanic starts firing rockets into the night sky, those are dismissed by the same ship whose officers refuses to believe that Titanic could be in trouble. Eventually, the ship Carpathia receives the distress call and heads toward Titanic, but they are hours away and by the time they arrive it will be too late. Smith orders the lifeboats to be lowered with the women and children to be saved first. At first, not many people want to get in the lifeboats because they are either convinced that the ship can’t sink or because they don’t want to part with family members. As the situation grows more dire and there’s no denying that the ship is sinking, there’s a rush to fill the boat with many men trying to sneak aboard. Lightoller and Murdoch each work opposite sides of the ship lowering the lifeboats and keeping the masses at bay. By this point, the only passengers to have been saved are the first or second class passengers, while the third class passengers (“steerage”) have been locked in place by gates keeping them in the bowels of the ship. As the ship starts to slide under the water, a funnel breaks loose and kills many of the people treading water nearby before disappearing under the surface. The survivors must endure the freezing water and frigid temperature for hours before the Carpathia arrives to save them. By most accounts, A Night to Remember is the most historically accurate out of all of the films made about the accident. That’s not to say that it’s 100% accurate since we’ve learned a lot more about what happened since this movie came out such as the fact that the Titanic broke in two parts at the end, which isn’t reflected in this movie. Other that that, this feels completely authentic and matches the many accounts that I’ve read. The performances are all excellent and this feels more like a trip back in time than a movie. It’s absolutely amazing how well this film holds up today especially considering just how much of a shadow Cameron’s movie made. The effects are still very impressive today and the ingenuity and model work displayed here is astounding. While later movies may have captured the marked as far as sheer spectacle is concerned, if you are looking for a no frills experience that feels absolutely authentic and free of manufactured melodrama, then this is the movie for you. This 1080p (1.66:1) transfer is beautiful to look at and a vast improvement over previous DVD releases, including even Criterion’s previous release of this film. A Night to Remember has been completely restored and it’s never looked better. According to Criterion, ”This new high-definition digital transfer was created in 2K resolution on an ARRI Laser Scanner from the original 35mm camera negative, which was restored by the Private Archive for ITV Studios Global Entertainment. Thousands of instances of dirt, debris, scratches, splices, warps, jitter, and flicker were manually removed using MTI’s DRS and Pixel Farm’s PFClean, while Image System’s DVNR was used for small dirt, grain, and noise reduction.” All that work paid off as this transfer offers excellent detail and clarity that really makes a difference towards the end of the film that takes place at night. The restoration has also successfully removed all signs of age from the movie including scratches, dirt, debris, and more. If you want to see how it looked before this restoration, take a look at the “En Hatt Att Minnas” extra and you will be shocked at the difference. The black and white picture simply looks sharp and amazing! A Night to Remember only offers a monoaural LPCM 1.o track which you would think wouldn’t be that great, but it’s actually very impressive. This new track was remastered from “the original monaural soundtrack [and] remastered at 24-bit from the 35mm optical soundtrack. Clicks, thumps, hiss, and hum were manually removed using Pro Tools HD. Crackle was attenuated using AudioCube’s integrated workstation.” The dialogue is clean and crisp and doesn’t suffer from age related defects such as background hiss or audio dropouts. The score by William Alwyn is well balanced with the rest of the track and also sounds fantastic. Being a Criterion release, it should come as no surprise that there’s some excellent extras on this disc which is especially nice considering how old the film is. All of the extras are in high definition as well! The Making of A Night to Remember – This hour long documentary was directed by Ray Johnson and it focuses on producer William MacQuitty and his recollections, pictures, and home movies that he took during the making of the film. We also get to hear from the novelist Walter Lord, whose book of the same name was the basis for the movie. They talk about getting the movie made and how they tried to make it as authentic as possible. What was especially fascinating to me was to see how they did a lot of the special effects which are still impressive to this day. Eva Hart: Survivor – Another highlight of these extras was hearing from Eva Hart who was one of the survivors of the Titanic and still remembers every detail. For a history buff like me, it’s just amazing to hear a first-hand account of the disaster who is still around. Hart shares how her family ended up on the Titanic after their original plans were canceled and how her mother was sure that something bad would happen. We also hear about the Titanic’s final hours which coming from an actual witness only makes the tragedy even more real and moving. I am so glad that Ray Johnson filmed this interview with Ms. Hart in 1990 when he did, since she died on February 14th, 1996. En Hatt Att Minnas – This is a thirty minute documentary that was broadcast in 1962 in Sweden as part of the the fiftieth anniversary of the Titanic’s sinking. They use some terrible looking clips from A Night to Rememberand they also have some interviews with three of the survivors that reside in Sweden too. While the documentary is in Swedish, there are English subtitles and it was interesting to hear another first-hand account. If the filmmakers and novelist of A Night to Remember had talked to her earlier, they would have known that the ship broke into two parts before sinking and didn’t go down in one piece as they erroneously believed. The Iceberg That Sank the Titanic – This is an episode from the BBC’s Natural World series that delves into where the iceberg came from, how it was formed, and what path it took before its historic encounter with the Titanic. We also see a picture of the actual iceberg that Titanic hit and we observe some experiments that show what happens to ice when its subjected to water. While this may no interest the majority of the movie going public, I thought it was interesting. Commentary – This audio commentary has been ported over from the previous Criterion DVD release of the movie. It features Don Lynch and Ken Marschall who wrote and illustrated ”Titanic: An Illustrated History” and who are well informed about the ship and the accident. Booklet – This is a fairly think illustrated booklet that contains film critic’s Michael Sragow’s essay “Nearer, My Titanic, to Thee”. It offers some interesting information as well as some cool pictures and it’s a nice extra to include. Trailer – The film’s original trailer. 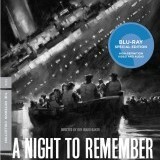 A Night to Remember represents a perfect example of the kind of release that Criterion is famous for – it’s a historically relevant film that’s not only been brought back to the public, but it’s also been restored to such an extent that this Blu-ray is probably better than the original release print. The picture and audio quality have been lovingly restored and the extras are excellent and not the usual EPK fluff we usually get from other releases. For all Criterion and movie fans in general, this is a must own release so pick it up before it goes out of print!